Due to the work that the likes of Paul Riley and I have undertaken in recent times we now have a greater understanding of the importance of shot location. Of course, it’s totally obvious that shooting from close in spots will be more rewarding than taking shots from Andros Townsend territory, but it’s not that long ago that shot location wasn’t as topical as it is now. OK, so now that some progress has been made on where shots are taken from, how about we go one step back in the attacking chain and spend some time looking at where the passes were made from for the shots that were taken? Like shot location, I would assume that the location of the final pass before the shot (“Key Pass” in Opta language) will have some bearing on the chances of the subsequent shot being scored. It would therefore be helpful to be able to monitor and manage the areas that teams allow key passes to be played from as it provides them with another KPI to target and manage. Obviously a team will try their best to limit shots from good locations, but if they were able to also manage the areas that they allow the Key Passes to be played from that just might leave it easier for them to ensure that the shots from good locations don’t actually occur. Once again, to the best of my knowledge, the only person that has done any work in this regard has been Paul Riley. To aid analysis I have broken the pitch into 5 zones, and used data from StatsZone and Squawka to log the location of each chance created in the Big 5 Leagues for the current season. Remember, in this study we are interested in where the pass that set up the shot originated from, not where the shot was taken from. Encouragingly, those numbers look like they make sense..
18.8% of shots (regardless of where they are taken from) that come as a result of a pass played from within the Penalty area result in a goal. As expected, this zone provides the highest strike rate amongst our passing zones. The next most lucrative passing zone in terms of the scoring of subsequent shots is passes played from a team’s own half. At first glance this seems counter intuitive, but I think it does make some sense. Remember, we’re not saying that a high proportion of all passes played from a team’s own half results in a goal. Rather, where a pass leads to a shot and that pass originated from a player’s own half then we get a decent conversion rate of almost 10%. I would venture that this success rate is due to the fact that such a pass may result in a through ball or some other form of counter attack where the opposition defence is not adequately set and thus the conversion rate is better than for the other zones. Next we have shots from passes made from the Byline zones which see a conversion of 9.1%, and finally we see that shots which stem from passes made from deeper than the edge of the Penalty area have the lowest conversion rate. It doesn’t seem to matter whether these passes are made from the centre of the pitch or towards the sidelines as both zones see a similarly low conversion rate of 7.5%. Presumably the overall conversion rates are reduced within these passing zones as a large majority of the passes that lead to a shot will be played in front of the defence, and thus the shot will be relatively easy to defend against. There is no doubt that any macro analysis such as this will miss out some individual subtleties in that not every shot that comes from a pass played from within the penalty area will be gilt edged. Likewise, not every shot that comes from a pass further out the field will have a low probability of being scored as it may split the defence and leave the striker in a one on one situation against the opposition goalkeeper. However, it’s incredibly useful to be able to see the general impact on probable shot conversion that is implicit in the location of the Key Pass. And besides, we have to start somewhere with new analysis!!! Now that we have ascertained the conversion parameters around each of the passing zones, what next? Teams know that having shots in good locations is helpful in attempting to score goals and win games. Of course, no team sets out to shoot from bad spots, or indeed wilfully allow the opposition to shoot from good locations, but it is equally important for a team to know the impact of where the final pass comes from in determining the probability of any shot resulting in a goal. Crucially, this information may be able to help explain why certain teams are struggling to score goals or keep them out at the other end. It may be able to tell us why certain teams seem to give up high quality chances as opposed to us having to settle for the fact that we just report on the fact that they do. A case in point is Man United in this current EPL season. Note that not all shots follow on from a pass. So any shots that come about as a result of a misplaced defensive pass or a tackle will not be included in the table, as no pass has been played. Earlier we seen how valuable shot assists which originated in the penalty area were in terms of contributing towards a team’s goal count and so the above table has been sorted in descending order of Penalty area zone percentages. As teams will create different numbers of shots, in order to aid analysis I have used the percentage of the origin of passes of a team’s total as opposed to the absolute numbers. Liverpool has created the highest percentage of their chances from the penalty area (25%) and they are closely followed by Southampton. Man City, and perhaps surprisingly Tottenham and Cardiff complete the teams that manage to create more than 1 in every 5 shots they take from the confines of the penalty area. As we look further down the table we see that, of the big named teams, Man United and Chelsea have struggled to create chances from close in with just 15% and 14% of their respective chances being created from here. Giving Chelsea the benefit of the doubt, perhaps if a team is full of attacking playmakers and attacking midfielders they are happy to thread high quality passes through from zones which generally wouldn’t expect to see a great deal of success. The Byline zone lives up to expectation with both Stoke and West Ham being the only teams to have 30% or more of their chances coming from the byline. I would suggest that Man City is at a sweet spot with ranking 3rd in the table for the percentage of their shots that originate from both the penalty area and the byline. We have ascertained earlier that the average goal probability for shots stemming from passes played from the Centre and Deep Sides zones are converted at similar rates. So although the difference in conversion rates is minimal I am showing the figures for the two zones separately as it helps identify a team’s style of play. We’re not surprised to see that Arsenal rank highly with 53% of all shots coming from Central zone passes, nor that Stoke sit bottom of this section at 30%. Fulham sitting above the Gunners at 54% is a little more surprising however. 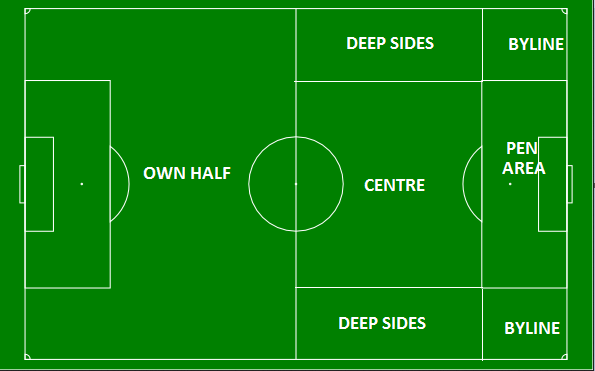 The Deep Sides numbers are very interesting, or at least Man United’s figure in this zone interests me. We can see that Man United, at 22%, is the only team to create more than 19% of their chances from these Deep Sides zones, which is not a great claim to fame as this zone has a low probability of Key Passes resulting in goals. Can we suggest that passes from this zone show the least imagination and they are the easiest position to get to, with the resulting lowest probability in producing a goal once they create a shot? Can this help us understand why Man United is struggling this season? Man City topped the table with 27% of their shots coming from passes from within the penalty area, but Man United was hot on their tails with 24% from this same zone. This figure is more in line with the expectation of the League Champions, and a club of the quality of Man United. Now let’s look at the Deep Sides category for last season. Man United had just 12% of their chances created coming from this zone last year – only West Brom had less than United. So it appears that Man United is attacking differently this season, and not in ways that are good. They have swapped chances being created from within the penalty area with ones being created from the deep sides; which doesn’t sound like a great deal to me………. Is the answer David Moyes? Could he have “broken” Man United in just 11 games? Not only have United increased their percentage of shots that come from Deep Sides passes from 12% to 22% this season, but coincidentally look what has happened Everton’s numbers during the same time period. Under Moyes last season, Everton had 20% of their Key Passes delivered from the Deep Sides zone, but so far this season, under Martinez, Everton have played just 12% of their shot assists from this zone. It certainly appears that this particular set of numbers is systemic, and I don’t imagine that they will please the majority of Man United fans. Surely they expected more of Moyes than to turn Man United into Everton? Last season Rooney and Van Persie created a combined 3.97 Key Passes per90 minutes. Their combined creative output this season sits at just 2.33 per90, with Van Persie seeing the largest reduction in his Key Pass numbers. Everton fans won’t be surprised to see that it’s Patrice Evra, United’s left back, that has been the main beneficiary of Van Persie’s reduced number of chances created. 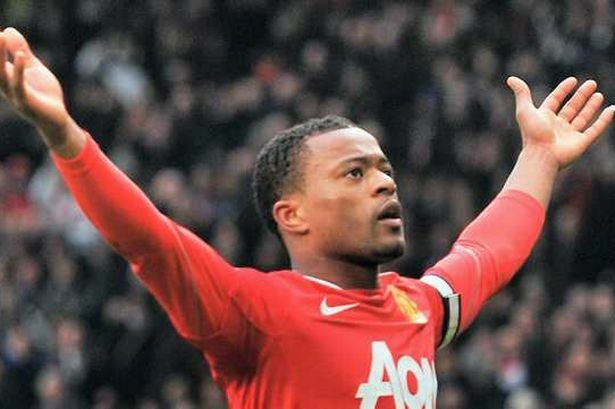 Last season under Fergie, Evra had just 0.66 Key Passes per90, and this season with Moyes at the helm he has more than doubled his output by creating 1.49 per90. Meanwhile over at Goodison Park, Leighton Baines was the Premier League’s top Key Pass creator last season with 116, this equates to 2.85 per90 minutes. At this point it is worth noting that I include injury time in my minutes played calculations. During the opening 11 games of the new season, Baines has only averaged 1.18 Key Passes per90, which is substantially lower than last season. I know that we are only talking about two players across one and a bit seasons but there certainly appears to be some weird David Moyes / Left Back penchant going on, perhaps to the detriment to the team and other important creative players. Worryingly for United, it’s not just going forward that they have struggled this season. Up until two weeks ago, the quality of the average chance conceded by Man United was the highest by any team in the 2013/13 Premier League. Norwich’s 7-0 drubbing at Man City has seen that mantle now passed to the Canaries, but after 11 games the quality of the shot allowed by Man United is the second highest in the league. As defending champions, that statistic is incredibly disappointing and perhaps the metric under analysis in this article can shed some light on just why the chances United are giving up this season are so good. We can see that one quarter of all shots that United give up are set up by a pass from within the penalty area. Unsurprisingly, that number is the worst in the league. But look at the teams that follow them in this table; Crystal Palace, Norwich, Aston Villa, Newcastle and Fulham. None of those teams will expect to be competing for European places this season, and unless Moyes can prevent the opposition from creating chances from within United’s penalty area neither will Man United. In a somewhat cruel twist of fate, Everton have performed exceptionally well in this measure with an amazingly low 7% of shots created by passes from within the penalty area; this represents just 6 shots in 11 games. There is a danger in over fitting the statistics to fit the narrative, but there seems to be something at work that is affecting the potency of United’s defence, as well as their attack. Last season United topped the league in blocking 30% of the opposition’s shots. Like the other measures we have looked at in this piece, they have considerably underperformed that threshold this season. Their block rate is just 21% during the opening 11 games – this ranks them second from bottom in this measures. Has some hesitancy crept into their defending? Does the reduction in the number of shots being blocked support that view? The large increase in the proportion of shots that are set up by the opposition from within the penalty area suggests that teams are finding it easier to attack through the heart of United this season. I have no doubt that the proportion of shots that Everton conceded which follow passes from inside the penalty area will regress as that 7% figure is off the scale (the lowest for any team last season was 15%). But at this stage it looks like Roberto Martinez may well have been a better fit for Man United than David Moyes appears to be.